This article is part of the seo website optimization series. In previous article we covered some of the basic on page seo techniques. Next, we will highlight more technical features to help search engines to understand your site even better. Page name: this text is used to display a page in menu bar. Page url: this is the link to a specific page on your website. Key word use in a URL can act as a ranking factor. A well crafted domain is easy to understand by humans and search engines. It likely tells what the content of the page will be about. SEO title tag: this tag is displayed on search engine result pages. It's crafted so it triggers to click and to share. Search engine tools use this HTML tag to understand what your page is about. Browsers use the tag to display a tab placeholder, providing a better user experience when different browser tabs are open. Use keywords in your SEO title, but don't overkill. It's recommended to keep your title under 60 characters long. 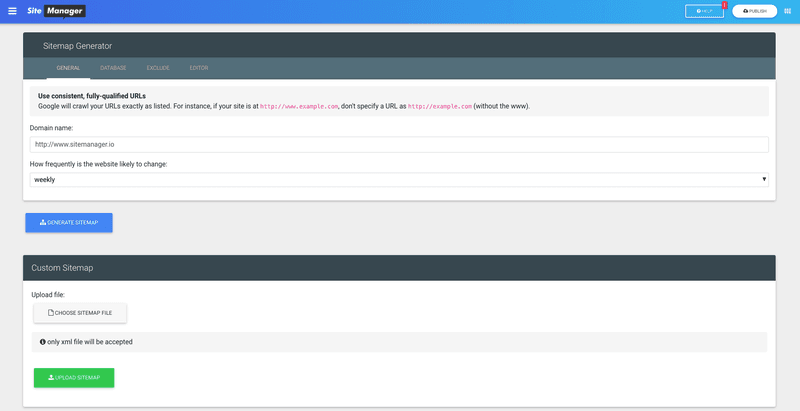 update 07/2018: Custom page url is added as a new SiteManager feature. 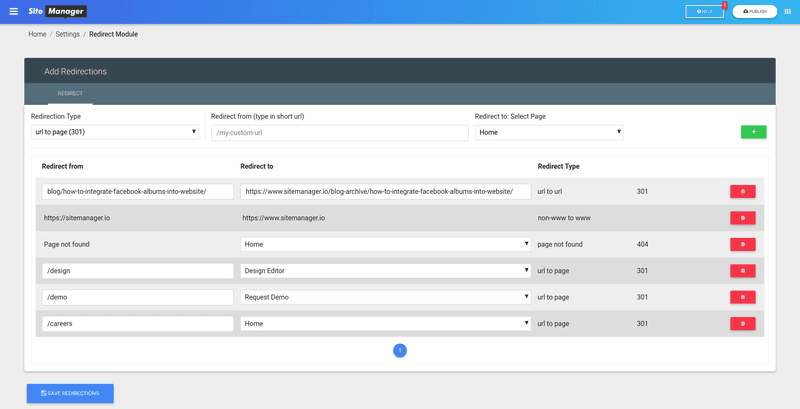 SiteManager feature: page url, page name, SEO title and description. This hidden HTML attribute of maximum 300 characters gives a brief summary of the webpage. A meta description is not defining in Google's search algorithm. The main reason to create a stunning description is because it improves click through rate. Open graph allows your page to become a rich object. It gives social networks more information about the page, improving the way how it can display links when sharing content in their network. Open graph attributes (og.title, og.img, og.description) in website code doesn't really impact SEO ranking. But as the importance of social networks is growing, Google analyses open graph in its search algorithm. Duplicated content harms your SEO rankings. The canonical url tag helps webmasters to eliminate self-created duplicate content in the index. It makes clear to the search engines to consider multiple pages as one, without redirecting to another page. update 07/2018: SiteManager added the feature to set your canonical page or link other pages to its canonical. This feature is live for static pages, still working on plug&play databases. No index: although a search engine can crawl your page, the meta tag in the source code will disallow the engine to publish the result in the search index. No follow: This meta tag disallows search engines from crawling the links on that page. Authority of the page will not be passed on to the pages it links to. update 07/2018: After installing from upgrade store (folder: seo & analytics) - the no index / no follow feature will be accessible in page settings. When you are building a multilingual website, a HReflang tag informs search engines about the language you are using on a specific page. This information is used to display the correct language variant of the page for users querying in a foreign language. The goal os this html tag is to display the right content to the right users, making the search engine results more accurate. update 07/2018: SiteManager has added the HRefLang-tag feature to its language module. The SiteManager pagespeed module automatically optimise your website code. But, as always, you are in control. In the developer application you can define your compression settings. update 07/2018:SiteManager has released the page speed module in developer application. update 07/2018: SiteManager has updated the logo settings, making it possible to set your logo alt tag. The correct use of redirects is important for search engine index and rankings. A 301 redirect is common used and tells search engine that page A has been moved permanently to another location B. The link weighting from the original page will be carried to the new page. A 404 is a fall back when a page doesn't exist anymore and there is no alternative page with similar content to refer (using a 301). Having a sitemap doesn't help to index rankings. Google indexes your site because the algorithm found your website and considered it to be qualitative. But by submitting a sitemap, you do give search engines a hint that you assume your pages are good enough to be indexed. TIP:When using sitemaps in your website, please make sure your are consistent. Don't included a page in your index when you have noindex, nofollow metadata in source code. Having the Google verification file on your website, doesn't improves your SEO rankings. You need to install the verification file in orde to use the Google Search Console. This tool is the fastest way to submit a website, page updates or new pages for indexing. We hope this summary is useful for SEO website optimization and helps you improve your business. We did a lot of research before writing this article and we suggest you do the same before implementing changes. We are grateful for all the information we found online and therefore refer to our most important content sources e.g. www.moz.com, www.blog.hubspot.com .